There’s poetry in baseball. The movement of the ball as it flies off the bat; the slide into a base; the swing of the bat. Hot summer sun beats against your skin from seats in the bleachers, a permanent fixture since 1937. Animated crowds pack themselves inside for the widest view of the field. And if so inclined turn and wave upwards to the scoreboard operator, the third generation in his family to man the board. Wrigley Field is the past, it is the present, it is the future. They are all linked by fandom, those of us who bleed Cubbie blue. We were raised by parents, who were raised by our grandparents, and we are linked irrevocably by the love of the game, and the history of our team. Collectively we hang on each hit, each ball carried on the wind. It carries our hopes, our dreams in each at-bat. Each season ended with immortal words, “Maybe Next Year”. We would slink away and lick our wounds, another season lost to time. 108 years of time. They rewrote the story, and those of us who bleed Cubbie blue, breathed a collective sigh of relief, only after we jumped up and down, let out energetic screams and some of us even cried. I watched the series with my grandfather, who died in 1987. HIs picture lay on the table beside me;, facing the television. This he would have loved. That team would have sparked in him the delight of a child. How he loved baseball, how he loved the Cubs. Live in the moment when it comes. Leave for the sporting goods store, 20 minutes after they win and bask with others as we wait to buy the prized “World Championship” gear. It doesn’t matter that it’s midnight. As “Go Cubs Go,” plays from someone’s car, chat up the next jubilant fan and share the stories. “Where were you when the Cubs won?” For a mere moment, there was no division, collectively we were simply Cubs fans. It was the fourth largest gathering of humans in the history of the world. They snaked along the parade route to the rally. We packed ourselves into the park. It was a sea of blue, thousands of stories jammed together celebrating for themselves and for those who never got to see what we got to see. LIke nothing before, we rolled from the rally, stretched out along the avenue, steady and proud in gear. A club of millions. We are now experts in rooting for the champions, we’ve been here before. And yet, my stomach roils with each error, I hold my breath with each swing. We are giddy with excitement, because we know, how few and far between this could be. 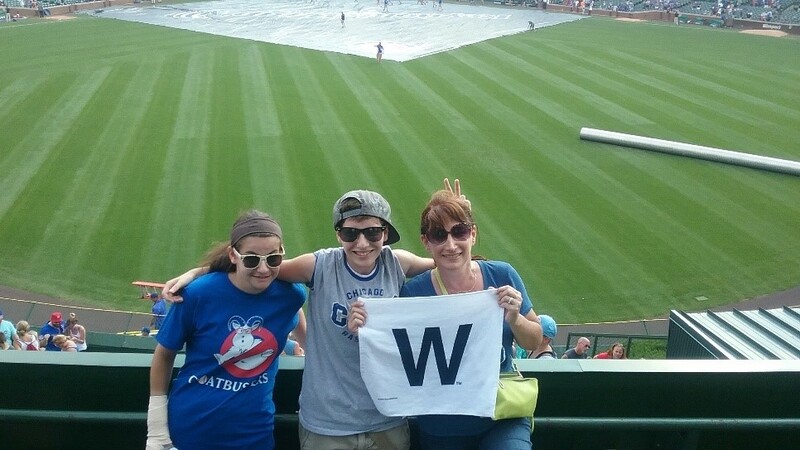 I’ve passed my affliction to my children; they are now the fourth generation of Cubs fans and they understand the suffering and jubilance of truly being a fan. I cried today when they squeaked out a win. I will always bleed Cubbie blue.